Aiming to travel the world shooting great content for great clients, Liam Brennan is a Brisbane-based cinematographer, published food photographer and straight up top bloke. He’s as comfortable as director of photography as he is a camera operator, and has rock-solid ability across the board — shooting, video content creation, editing and project coordination. Operating across multiple video formats and a variety of cameras — from high-end RED’s to DSLR’s and even Super 8mm film — his work now spans TVCs, documentary filming, and corporate content for TV and online. Liam enjoys working with other cinematographers, and is always developing new skills and relationships on collaborative shoots. Equally, he’s able to execute a director’s vision to his highest standard and prides himself on his ability to calmly deliver top-level content in the most demanding situations. With a knack for uncovering a story in anyone and the ability to convey true emotion, Liam produces a documentary series called Rough Hands. The series highlights the work of makers, artists, and artisans. For more than a decade, Liam was the frontman of a touring Australian punk band. This put him in touch with some of the big names in Australian music. 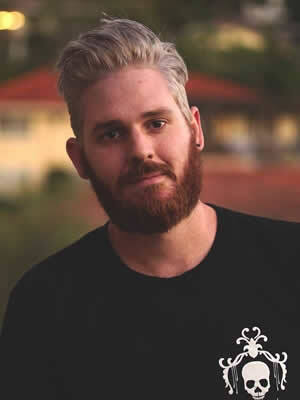 He’s worked as a camera operator for Violent Soho shows and music videos, and director on a seven-camera, sold-out show for internationally acclaimed musician HARTS. As a result, he’s developed ninja-like abilities that keep expensive camera equipment safe in some very intense situations. Liam has the tools, skills and ability to shoot, edit and deliver exceptional content worldwide. What can he do for you? Liam is a great team player, mastering both the technical and creative aspects of his role! Liam successfully tackled a very challenging job and was extremely enthusiastic and cooperative throughout the entire process. It was a pleasure working with him and I hope to do so again in the near future. We book Liam regularly as a DOP and would not hesitate to recommend him to other clients. He’s reliable, knowledgeable and has an excellent technical understanding. Liam can be relied upon to capture beautiful imagery in an efficient manner that ensures the final project stands out from the crowd. Liam is an excellent operator, has a keen eye for beauty and detail and is overall a pleasure to work with. Liam is flexible and incredibly hard working and always brings something more to every job I’ve had him on. I’ve always been impressed by Liam’s content and would not hesitate to call on him for any project – big or small. Always a blast working with someone who has a genuine passion for lighting and camera. Liam has the advantage of being a filmmaker himself, bringing a pragmatic approach to the entire process from pre-planning to post-production.